Aviva Kremer knew when she was just 8 years old that she wanted to be a rabbi. Now she is 27 and in her third year of rabbinical school at the Jewish Theological Seminary. It took Jonathan Kremer a bit longer to be sure that he wanted to become a rabbi. 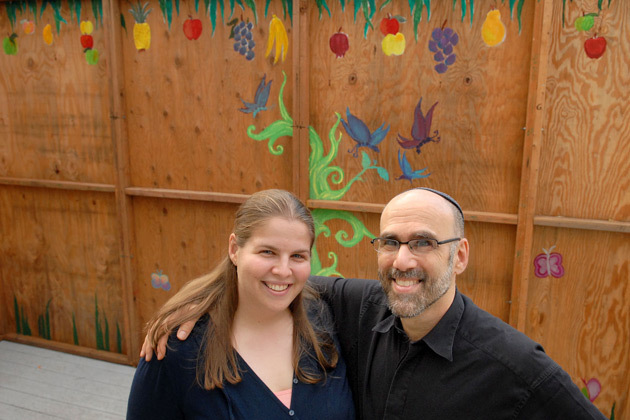 Today the 55-year-old former graphic artist is a first-year student at the Conservative-affiliated JTS and is the first known father to follow his daughter into rabbinical school. Not every 20-something would be happy about her dad being in the same school — and potentially some of the same classes — as she is, but Aviva says she was “giddy” when she learned her father had been accepted. “It’s exciting. He helped me prepare for the entrance exam for rabbinical school, and this time around I helped him prepare, so it was a nice little shift,” she said a few days before she left for Israel, where she is spending this year learning at the Schechter Rabbinical Seminary in Jerusalem. Her father plans to join her there in the spring. An untold number of sons have followed their fathers into the rabbinate and, since 1972, when the Reform movement began ordaining women, daughters have also followed their fathers into the field. And now both daughters and sons are following their mothers. In 2007, Hebrew Union College ordained a mother and daughter, according to a spokeswoman, and next May it will ordain both a mother and her son. The Reconstructionist Rabbinical College last year ordained Rabbi Ezra Weinberg, whose mother, Rabbi Sheila Peltz Weinberg, was ordained by the same institution in 1986. But neither of them, nor the Conservative-affiliated American Jewish University rabbinical school, in Los Angeles, has ever had a father attend rabbinical school at the same time as his daughter, their representatives say. Jonathan and his wife, Ellen, who works as an occupational therapist, have raised their three daughters — Aviva is the eldest — in the Philadelphia suburb of Ardmore. They sent them to Jewish day schools and various camps in the Conservative movement’s Ramah network, and created a home life rich in Hebrew and Jewish culture and observance. Middle daughter Hannah made aliyah on her own two years ago, and has just completed her army service. The youngest, Devora, is spending her junior year of college in Israel. For both Kremer JTS students, preparing to become a rabbi has been a long time coming. Through years of Jewish day school, stints as a camper and counselor at Ramah camps, and a junior year of college in Israel, followed by three post-college years there, “that feeling never left,” she said. Her father’s first step toward the rabbinate came in high school. He was working on a community service project in the JTS library when he came upon a book on Hebrew calligraphy. That sparked his interest in Hebrew lettering, he said, which led to a career as a calligrapher and graphic artist, creating ketubot and limited-edition versions of Jewish texts, among other things. “Five years later, my roommate was a doctor and I was a half-decent calligrapher,” he said, dryly. As Jonathan built his career and his family life, he also grew increasingly active in his local Jewish community. He led shiva minyans, gave a weekly sermon at the Thursday morning service at his shul and occasionally filled in for the rabbi or cantor when they were on vacation. “It was a comfortable fit,” Jonathan said. Then last spring, when Jonathan’s 90-year-old father was dying, he told his son that he wanted him to conduct the funeral. His father died just before Passover. Jonathan soon called JTS for a rabbinical school application. Two months later he had his interview, and was accepted the same day. While they each have more study ahead of them before they are ordained as rabbis, both Kremers hope to ultimately be able to lead congregations. Could future rabbis Aviva and Jonathan Kremer find a joint pulpit?